Ok so DESIGN. DECORATING. That is what I do here; As many of you know I offer different levels of help and service. Some online, some in person, some more full service, most just consulting. I see a project once or twice and make suggestions and you run with it. That works for me with my boys the ages they are and it fits the budgets of many of my clients. Of course there are exceptions but this particular client had me at “little old cottage in Birmingham.” I love that city and we immediately hit it off and went fast. She did a mini which is like $295 for three questions via email (maybe its gone up ask leslie at clients at hollymathisinteriors.com) but its specific and very focused. This girl took that little mini consult and did this. I dare she may not have needed Holly Mathis Interiors but I am glad to be a part. 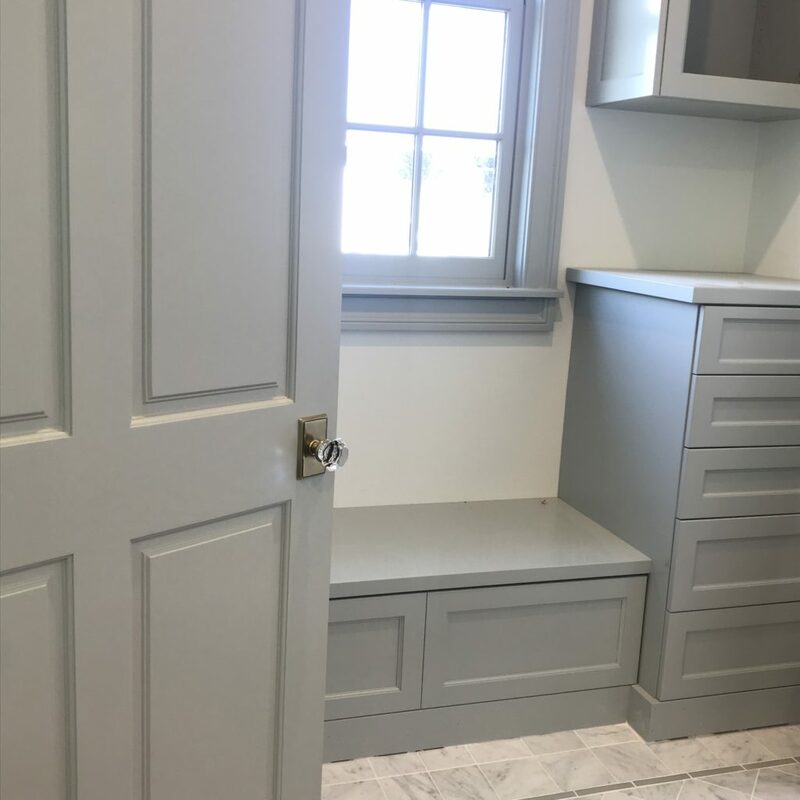 It was originally a 3 bedroom and 1 bath house and the homeowners figured out how to make it a two bath with parts from the master suite and mudroom. The house was originally built in the 1930s. Love that. 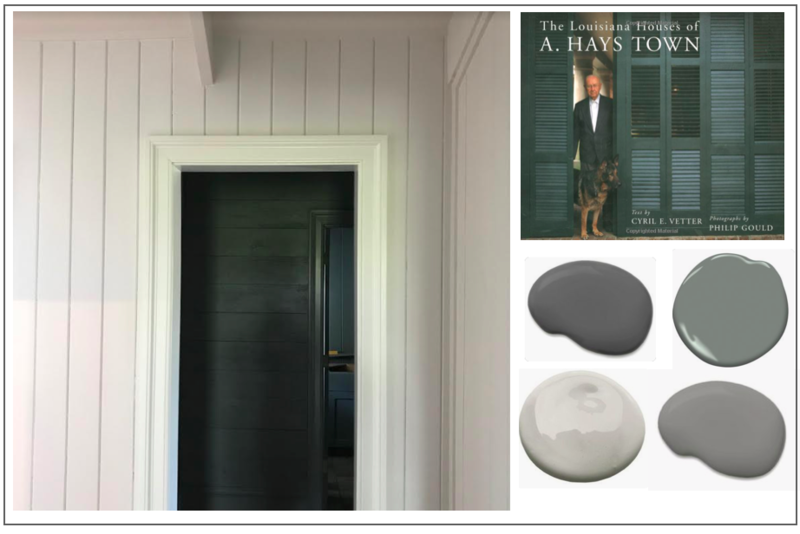 This style fits that age house so well…most already have it! So how did this work? 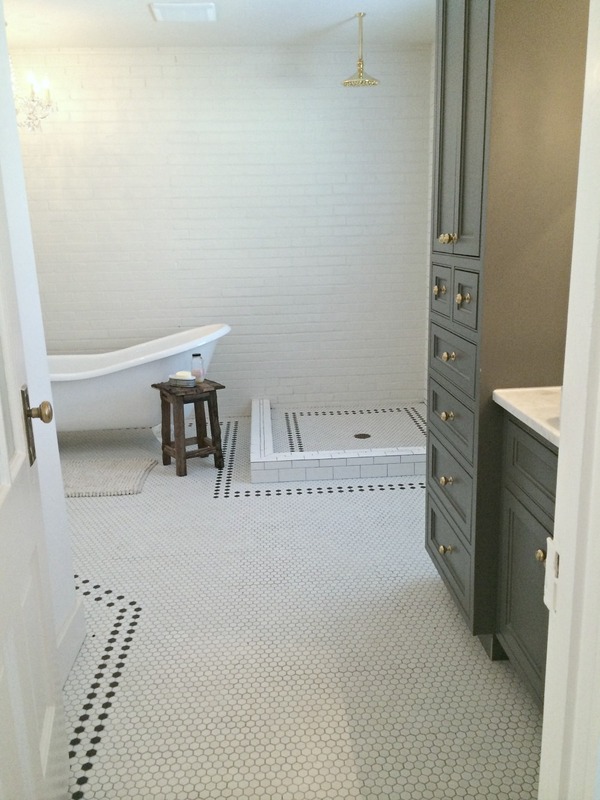 We emailed a few times and exchanged ideas and some pinterest pics of tile floors and patterns to attempt… She showed what she already had in mind and I think my affirmation and slight direction allowed her to spread her wings and make bathroom BEAUTY! The chandelier and original rock wall add so much character. 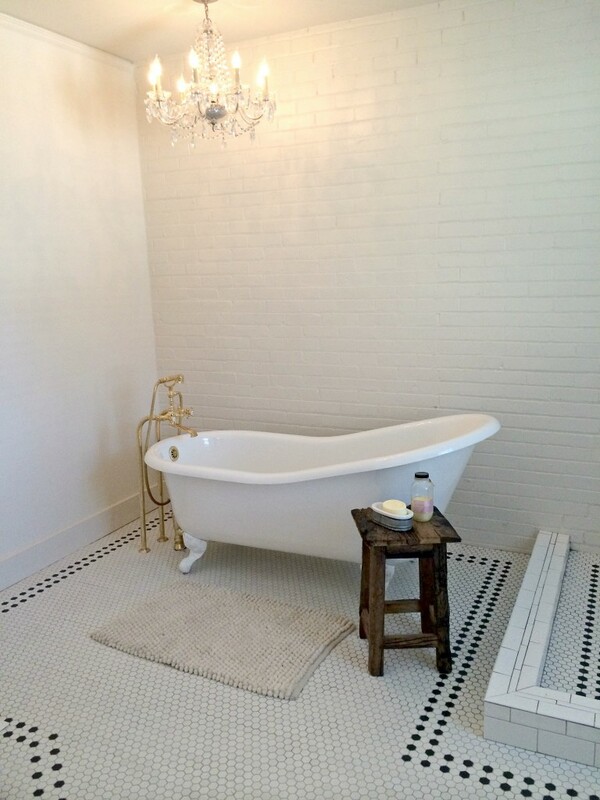 I love how each surface is different: hex tile, marble, subway, brick and I think some sheetrock. 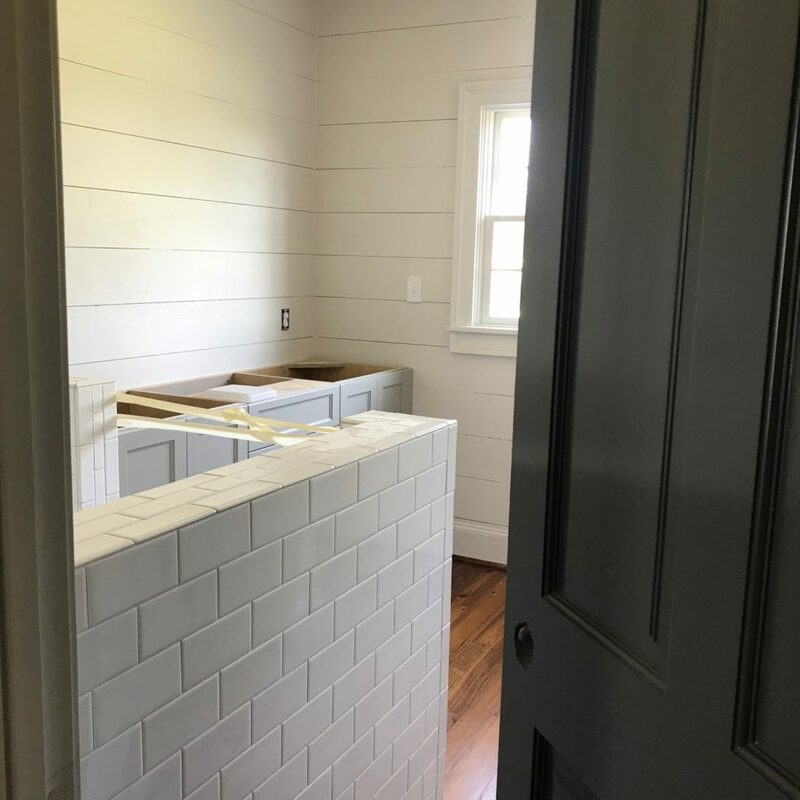 Nothing says “old house evolution” like mixing materials this way and Nikki and her husband and tile guy and cabinet guy did AMAZING work! 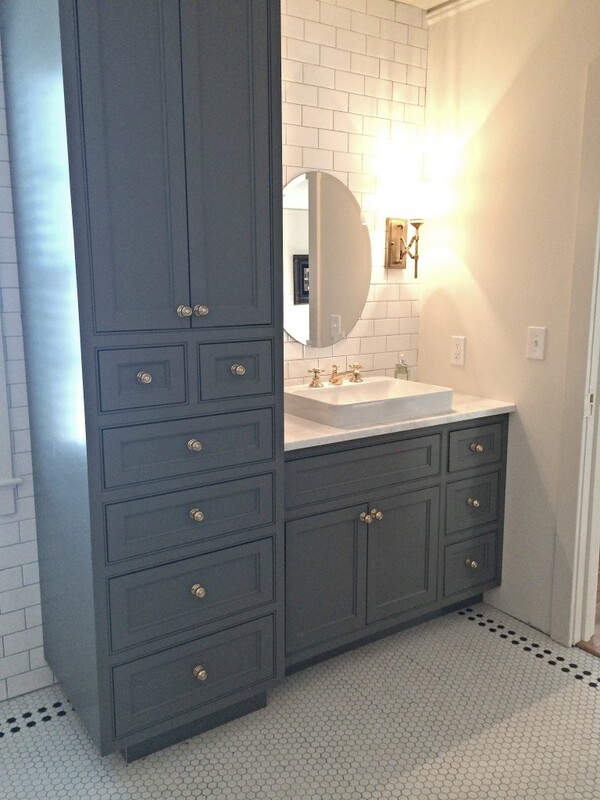 Those Kingston brass fixtures make me want to cry! 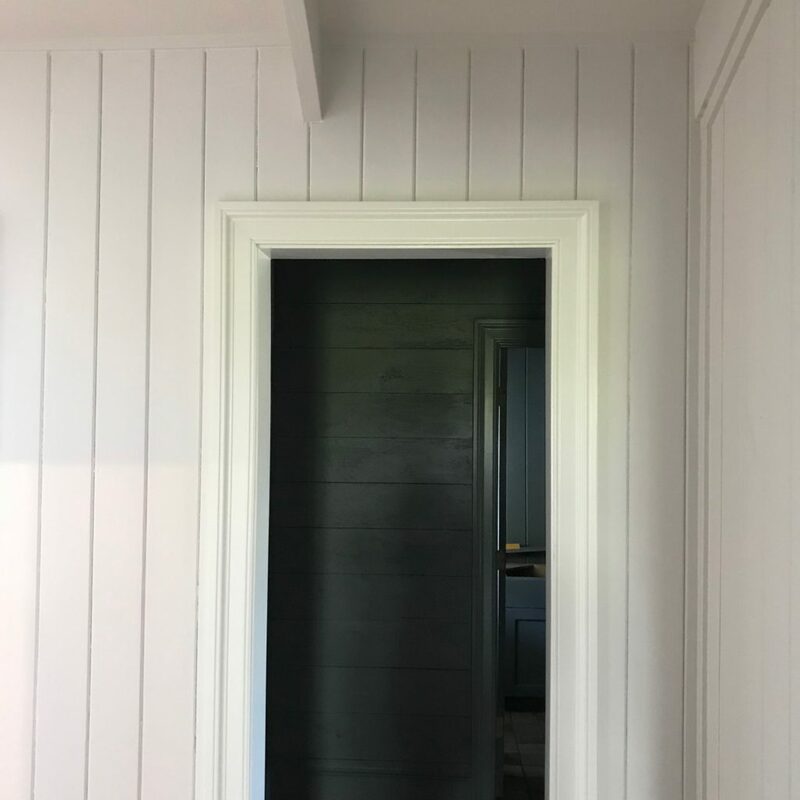 Door from the nursery that they moved to bathroom….um yeah we are probably thinking the same thing… Bamboo shaded (privacy lined) stat! The plumbing fixtures are the living brass from Newport Brass via Ferguson Showroom in Birmingham. The cast iron tub and sink were also through Ferguson. 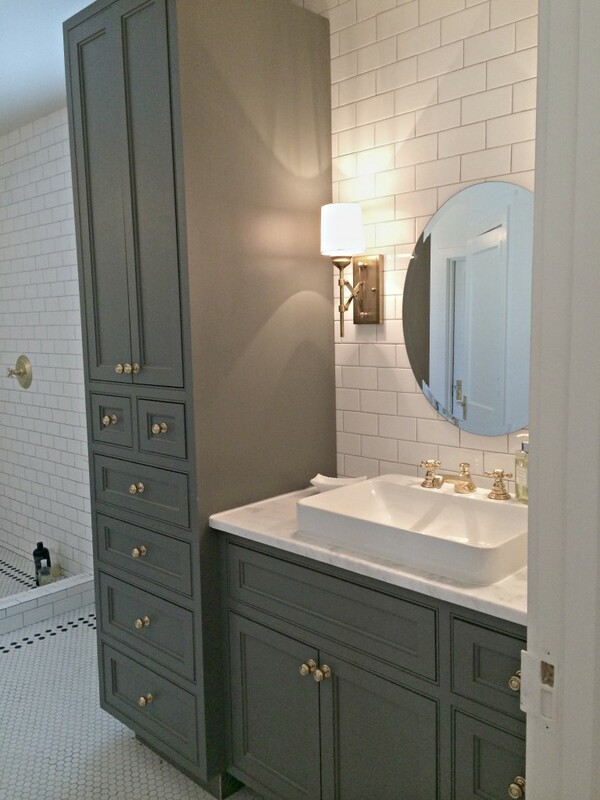 Cabinet maker, Tim Pollard at Alabama Cabinets who made the bathroom vanity. 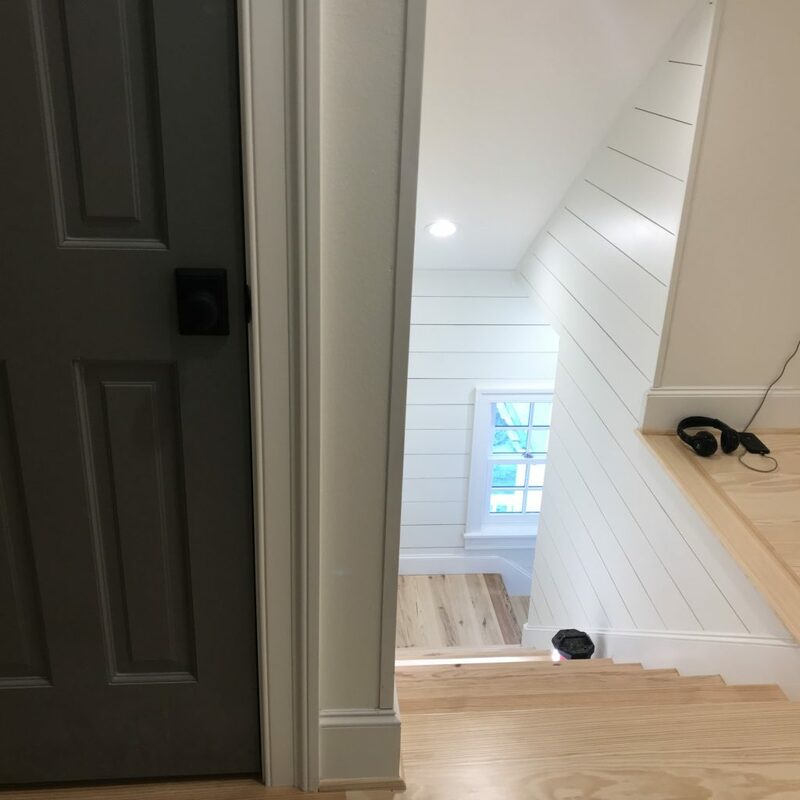 Wall color is Moderate White from Sherwin Williams. The vanity sconces came from Mayer Electric. 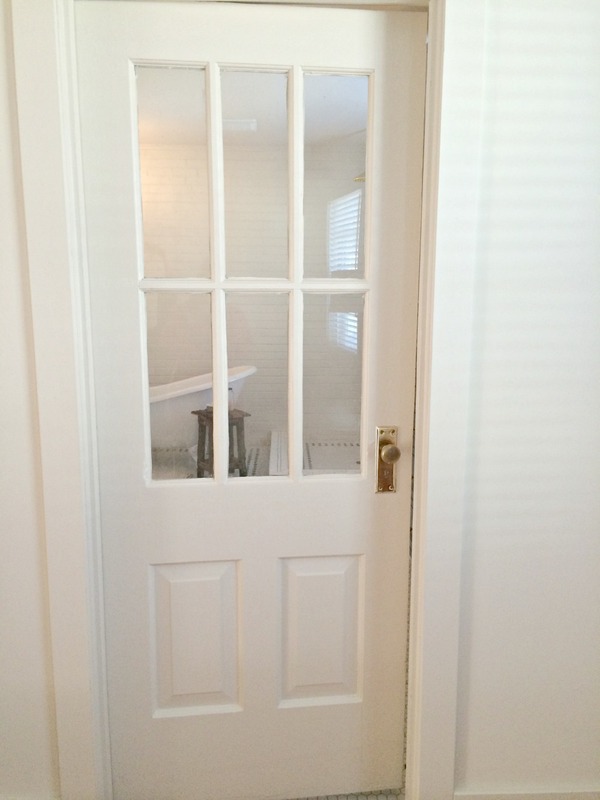 The door leading into the bath was the original front door to the home that had been in our storage! 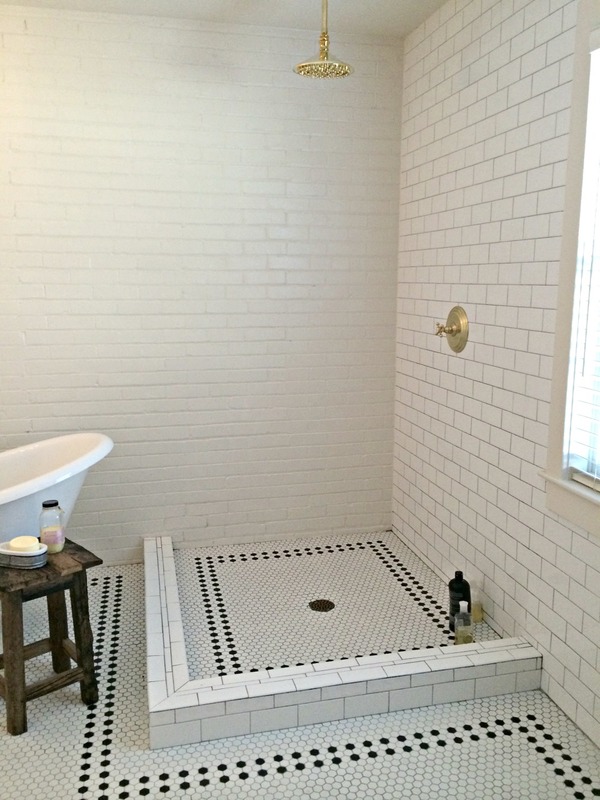 The brick wall behind the tub and shower is the original exterior wall left exposed. 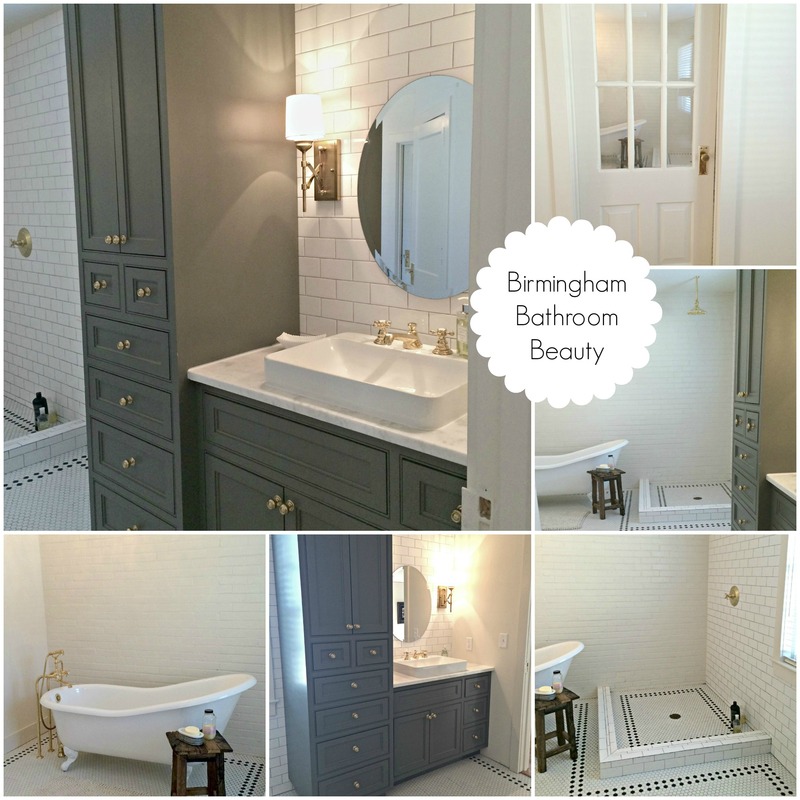 Thank you Birmingham mini client for sharing your beautiful bath!